South London singer Jodie Abacus has been making waves over the last 12 months with a series of upbeat, life-affirming singles. Admittedly, they're tiny waves - but lots of tiny ripples can combine to make a tsunami. Probably. I never studied Oceanography, ok? Songs like She's In Love With The Weekend and Good Feeling have earned the youngester comparisons to Stevie Wonder, Michael Jackson, ELO and Steely Dan. Which, let's face it, is an amazingly diverse set of references. His latest single keeps up the happy vibes. Called I'll Be That Friend, it's bouncier than ten tiggers - although it turns out the song was inspired by a pretty bleak year in the singer's life, which started with a nasty bout of pneumonia and ended with a break-up from his long-term girlfriend. "By the end of that year I wished I could still have the pneumonia instead of such bad heartache," he says in a press release. "I was crumbling, sitting in an empty room, just me and a bed and my keyboard. I started playing and crying at the same time. I felt like, if I was looking from the outside at this situation, I would give that person a really, really big hug and say it's all right. That's when I wrote I'll Be That Friend." He doesn't document what prompted the lyric: "Where's my sandwich?" By the way, if the start of that video seems familiar, it's a riff on the art project "People React To Being Called Beautiful", which went viral in 2013. 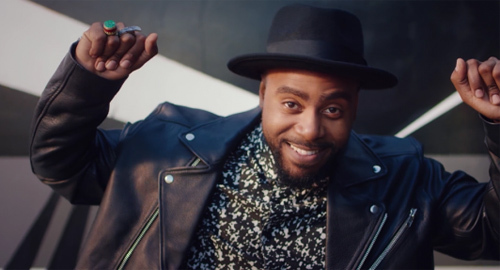 Shea Glover, who created that project, served as a consultant on Abacaus's video, alongside pop video veteran Ethan Lader (Bruno Mars, Cee-Lo Green, Mary J Blige).